I want to speak prophetically in this article. Currently many people in the Body of Christ are going through difficult seasons. It is possible that their faith is being challenged and it seems like you have been in a long cold season with your walk with the Lord. Please consider as you read this prophetic article that perhaps what you are experiencing is coming from the Lord and not the enemy? Let’s start with the life, ministry, and teachings of the Apostle Paul. Certainly, Paul, was not stranger to operating in the supernatural and dealing with opposition and oppression! What are the mysteries of the Lord? Here is what the word mysteries is translated in the Greek. In Strong’s Greek Concordance, reference 3466, it tells us the Greek word is musterion, pronounced moos-tay'-ree-on. This word is derived from the root word muo, meaning “to shut the mouth.” It is a secret or "mystery" through the idea of silence imposed by initiation into religious rites. Along this road that we call Faith, or the Christian walk, I have discovered that we all come to and must walk through differing and sometimes difficult seasons of God. Perhaps you are in such a season now? If not, then praise the Lord! One of the mysteries of God is the Seasons of Silence. In these Seasons of Silence, the Lord seems to be hidden and we may find it hard to connect with the Spirit of God. He is not speaking to us clearly. As the word musterion implies; The Lord shuts His mouth! He does not seem to be leading us as He once did. In fact, it may seem as if the Lord is a million miles away. We have entered into such a season when God may be difficult to discern, and it may be hard for you to have communion with the Lord. If this is the case; don’t worry! 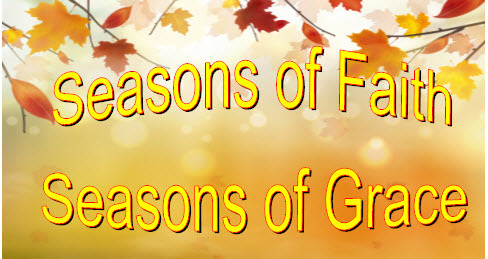 We need to remember that there are also seasons of grace as well. We can learn more about this Kingdom principle in Ecclesiastes. There is a time when the Lord allows us to enter into a time to keep silence. He is silent a times (seasons)—it is scriptural. During these times it seems that the Lord may allow our faith to be tested. In these seasons of hiddenness, our identity is often brought into question. (These questions can be soulish in nature or they can be a device of the enemy). We may be going through or entering into such a season of change. It could be a new job, a geographical move, or it could even be contemplating retirement. The truth is that these seasons of faith can be challenging and difficult in both the natural and in the spirit. Perhaps these seasons of darkness and seasons when it seems that our faith is being tried and tested are not emanating from the enemy. Perhaps the Lord is being silent and testing our faith to see if we will be faithful. Yes, I know that there are many who believe and preach that we can be eternally blessed and that we never need to experience pain, sickness, or heartbreak. However, bad things happen to good people. Why? God never promised you and me to have eternally blessings without measure on this side of eternity. There are seasons for these things (Ecclesiastes 3). Sure, some ministers preach that we can live to be one-hundred and twenty or that we can live in perfect health and prosperity. There is a lot of merit in those messages, and I have preached them myself. It has been said that into each life a little rain must fall. We are entering into such a season, and the Spirit of the Living and Loving God is testing His people. Sometimes these seasons present themselves as a “crisis of faith.” Someone we love (or ourselves) enters into a season of trial. It may be sickness or infirmity, or it may be setbacks in one way or another. And we do not understand how our loving and gentle friend, Jesus, could allow these things to unfold in our lives. Why do we feel and believe this way? Perhaps we misunderstand the scriptures. Or simply, maybe we are getting a little older. Perhaps we have done all the right things: we have tithed, we have helped the poor, we have read the word, and we have believed the word. We have read the scriptures, and we have worshiped the Lord. Yet, it seems that the Lord is million miles away and it is difficult to hear His voice. It seems to become harder to feel His amazing touch each day. We need a healing, a miracle, or a breakthrough and it does not come. Perhaps we have entered into a season of silence or a season of hiddenness. Though you may think that you are experiencing a crisis of faith, you are not. I want to encourage you that God is just playing hide and seek with you. He is seeing if you will stay true to the faith, (be faithful), as you go through this season. Just as paste is squeezed out from the tube when you put pressure on the toothpaste, the Spirit may put gentle pressure on us through a season of silence—then what is really in us will come out! Many people are experiencing this kind of gentle pressure at this hour. The Lord is testing our faith (James 1:3). Just because you can’t seem to connect with the Lord at this season does not mean that you are backslidden or out of communion with God. Just as the sun will arise tomorrow, this season will pass, just purpose in your heart to make a stand. Stand firm in the Lord and stay in the word of God. He has promised you in Psalm 89:28: “My mercy I will keep for him forever, and My covenant shall stand firm with him.” Again, God will never forsake you and He shall never leave you, no matter what you may be feeling (or not feeling) right now. Be encouraged! You are not alone! The Lord never changes. His love for you is eternal, and His yes to you is yes and amen. Generally, in these seasons of faith you will have opposition. In fact, the opposition or the oppression of the enemy may seem unbearable! If that is the case, the enemy has just shown or tipped his hand (or deceptive plans) to you. Because deceiving you (in your mind) in one way or the other is all that he can do. The accuser will constantly call into question your faith and the goodness and character of God. The enemy will try to get you to agree with him as he questions the Lord goodness and faithfulness. Don’t go there! If you are in such a season, rejoice because the end of the valley of darkness is actually very near, and the sunshine of a new day and new season are just around the corner. God is about to do a new thing in your life and circumstances (Isaiah 43:19). Trust in the Lord and allow Him to reveal Himself as Faithful and True as the Spirit leads you into a new season of faith and grace (Revelation 21:5; 22:6). Of course, sin can cause us to be separated from the Lord (Hebrews 7:26). Check yourself in that. However, remember that we still we have a strong, unchanging promise of unity with the Lord (no matter how we may feel). In Romans we read that Christ died for us; and furthermore, even if we cannot discern it, know that, He (the Lord Jesus) is interceding for each of right now! Just think about that! Nothing has the power or authority to separate us from the love of God which is in Christ Jesus our Lord. Yet, the enemy seeks to deceive or blind our minds to turn us from this amazing grace and truth of the Gospel. The enemy seeks to rob our faith. Hold on to your heart and keep your faith at all cost. How can we believe that we are immune to trials? Trials and tribulations are just an aspect of, one might say, a season of faith. The Apostle Paul experienced trials and tribulations, yet he was surely victorious! (2 Corinthians 2:4, 14). 2 Corinthians 4:1-3: “Therefore, since we have this ministry, as we have received mercy, we do not lose heart. But we have renounced the hidden things of shame, not walking in craftiness nor handling the word of God deceitfully, but by manifestation of the truth commending ourselves to every man's conscience in the sight of God. But even if our gospel is veiled, it is veiled to those who are perishing” (emphasis added). We need to understand that even in these seasons when we are seemingly hidden and dwelling on the dark side of the moon or walking through the valley of the shadow of death, God is with us. God is with you no matter what it may look like or feel like. The Lord is there (Ezekiel 48:35). We must walk by faith and not by sight (2 Corinthians 5:7). In the end, God’s grace is sufficient for you (2 Corinthians 12:9)! Dear Father, Thank You for seasons of faith. Today, Lord, I purpose in my heart to persevere and to overcome the seasons of hiddenness and the times that You seem to be a million miles away from me. Lord, no matter what I see or what I feel, I make a conscious decision to trust You and to believe You! I thank You, Lord, that the seasons of faith are shifting and that I am entering to a time of sunshine and communion with You and the precious Holy Spirit. Though I may be pressed, I will not lose heart; I will not lose my faith in You, Lord. I know that You are for me and that even now You are praying and interceding for me to break through into a new season. Lord, I may be pressed and afflicted everywhere I turn, but I am not defeated, I am not crushed. Lord, I may not understand what You are doing in my life in this season, but I purpose in my heart to trust You and keep my faith in You, Lord Jesus. Though I may be perplexed, I will not worry and I will not fear because I choose to trust You, Lord. I will not despair, I will rejoice in You, Lord. And I thank You that You have a future and a hope for me and my life right now! Thank you, Lord, that You will never forsake me or leave behind. No matter what it looks like, I will not be struck down and I will not be destroyed for You are with me now! In the name of Jesus, I pray. Amen! PO Box 903, Moravian Falls, NC 28654. To see Kevin’s other resources click HERE. from the very heart of Moravian Falls, North Carolina. Our new digital campus is now LIVE and ONLINE at the Link below!